« Re: Comey … WSJ got it right … in 2013! Will Mueller give Comey immunity? May not be as wild as it sounds. MSM has been buzzing about Trump reportedly considering pardons for some of his “satellites” termination of Mueller as special investigator … and, Mueller shining a spotlight on the alleged obstruction of justice charges that Comey kinda lobbed into the mix. Keep in mind that — well after the fact — Comey provided sworn testimony that that his investigation had not been subjected to any obstruction. Period. Then, after getting canned, he leaked his ‘file-to-the-memo’ to the New York Times. Strikes me, that Comey – as usual – was trying to be too cute by half and got himself into a bit of a bind. Did Comey really think that Trump was trying to obstruct justice? If yes, why didn’t he report the felonious infraction to his superiors? Likely answer, he (Comey) thought his superiors would be dismissive and just didn’t bother. Let’s cut him some slack on that one. But, what about the sworn testimony – after-the-fact – that there had been no instances of obstruction by anybody? Either Trump didn’t obstruct … or Comey lied under oath. 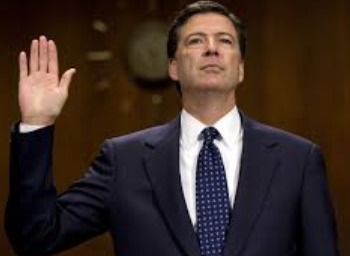 The latter (lying under oath) is the kind of stuff that got Martha Stewart thrown in jail (by Comey) … and got Scooter Libby thrown in jail by a previous special prosecutor. So, to get his retribution on Trump by pinning him with obstruction, Comey needs to dodge a perjury charge. Then, there’s the question of the memo (government property) that Comey leaked to the press. That just might be a felony. Side note” The revelation of a stack of Comey-authored file memos opens up a wide range of investigative paths. See Are Comey’s memos stored in Pandora’s box? Mueller’s key witness might himself be in some substantial legal jeopardy. That is, unless his former boss gives him his own stay-out-of jail card. So, immunity isn’t as wild as it sounds. This entry was posted on June 22, 2017 at 6:59 am and is filed under Comey, James, Russia - Russians, Trump, Donald. You can follow any responses to this entry through the RSS 2.0 feed. You can leave a response, or trackback from your own site.